We've got webinars coming up! 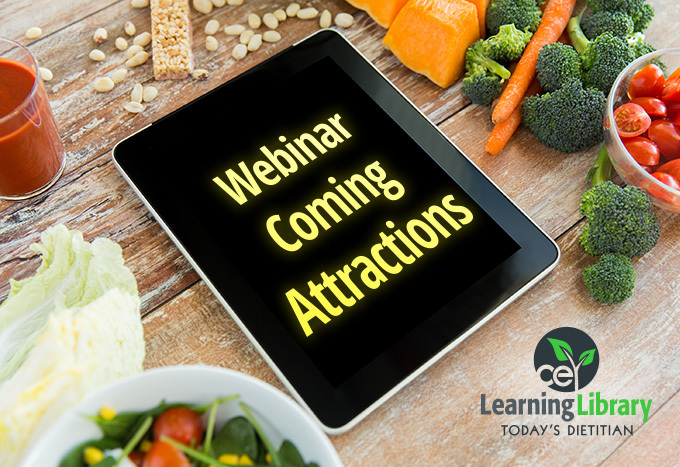 Earn some quality CEUs with these upcoming webinar presentations. Register now and put one, two, or all of these webinars on your calendar. In this webinar, attendees will gain a better understanding of what telehealth includes, such as the use of live chat and mobile health. More importantly, attendees will gain a better understanding of the benefits and concerns of telehealth while also reviewing current research findings. Learn tips and techniques to stay energized and prioritize so you can give your best in both your professional and personal life. Strategies shared in this session will help you make an impact in the workplace without forgoing a balanced, fulfilling personal life. This webinar will provide RDs with techniques for refining their counseling skills—a critical component in promoting positive client behavior change. After completing this session, practitioners will be more effective and confident, their ability to serve their clients will be much improved, and their clients will feel more empowered and committed to making healthy changes. Visit CE.TodaysDietitian.com for our full library of continuing education options.